This walk: 2012-6-20. Unidentified orchid, Caroline Farm/Wheal Caroline Mine, Potato Garden, heifer, cows, cotton grass, foal, Hurston Ridge, double stone row, cairn, Kes Tor, heath milkwort, Water Hill cairn. Link to Google Satellite view of the area - Statt's Bridge is at centre bottom of the map, Caroline Farm is above it. Previous walks in the area: 28th Jan. 2009 (Caroline Farm area) and 1st Dec. 2010 (Hurston Ridge area). Thanks to Hugh for today's photos. "I think the problem is that this is a right-handed walking pole ..... "
Diversion into a large tin-mining gert to avoid a large puddle! Site of a large water wheel from the Wheal Caroline era. That's a bl**dy big footprint! Caroline Farm, originally Wheal Caroline Mine, somewhat unproductive, closing in the 1830's, opening and closing several times with being a farm in between. Today the farm is doubling as a petting farm with ponies, bespectacled foals, cows, calves, sheep and lambs. Potato Garden, part of the farm. Caroline Farm ruins ..... the uprights are thought to be the remains of two substantial fireplaces either end of the building, there is evidence the building may have been subdivided. A view of the Potato Garden - tithes paid for Cot House & Potato Garden by farmer Henry Jenkins long ago. Another farm view, with the famous, but very rare, six-legged pony. No, Tess, you cannot go down that mouse hole! Scant evidence for the room being subdivided. General scene, with cotton grass, used in the past to fill mattresses. Fernworthy in the background. This close-up from 4th May 2011. An interesting brand or mark. Hurston Ridge with a distant view. Hurston Ridge double stone row, SX 6729 8250, one of the best examples of its kind, mostly in its original state. There are 99 stones arranged in 49 pairs. There is a cairn at its upper end, visible from the blocking stone at the lower end. Orientated NE-SW. The feature is described by J. Butler (1991), Dartmoor Atlas of Antiquities II, 25.9 Hurston Ridge stone rows and settlement, pages 30-31. A quite magnificent piece of Dartmoor archaeology. Gathered at the cairn at the upper end of the row. Another view of the row �.. this is from partway down the row where a �modern� bronze age enclosure wall crosses the ancient row. The terminal stone at the lower northern end. Looking slightly west of north - Kes Tor, at SX 6654 8627, elevation 437 metres (1433 feet). Looking north-east to Lakeland Farm and Shapley Common. The terminal stone at the southern end adjacent to the cairn; possibly the original Heath Stone or Heightstone which was one of the points of the 1240 perambulation. Looking just south of east at Birch Tor and the northern end of Hameldown. The white object is a coach. The group, photographed in among some very large grass plants! Heath Milkwort, Polygala serpyllifolia, (leaves are opposite at base of stem, likes wet, acid ground = Dartmoor). Otherwise, Common Milkwort, Polygala vulgaris, (the leaves are not opposite, likes dry neutral ground). During investigations on the cairn at the southern end of the stone row by Baring Gould, a stone axe and a cinerary urn (the latter upturned and covering a small heap of cremated bones on a flat stone, covered by a slab) were found in 1900 by the Dartmoor Exploration Committee. A photo of the restored Middle Bronze Age urn (1500-1000 BC) can be seen here (the larger of the vessels). The pattern around the rim is believed made by impressing the clay with a twisted cord. It was restored 1960-1962 and was put on display in the Plymouth Museum. According to Jeremy Butler, in the Dartmoor Atlas of Antiquities, Vol. 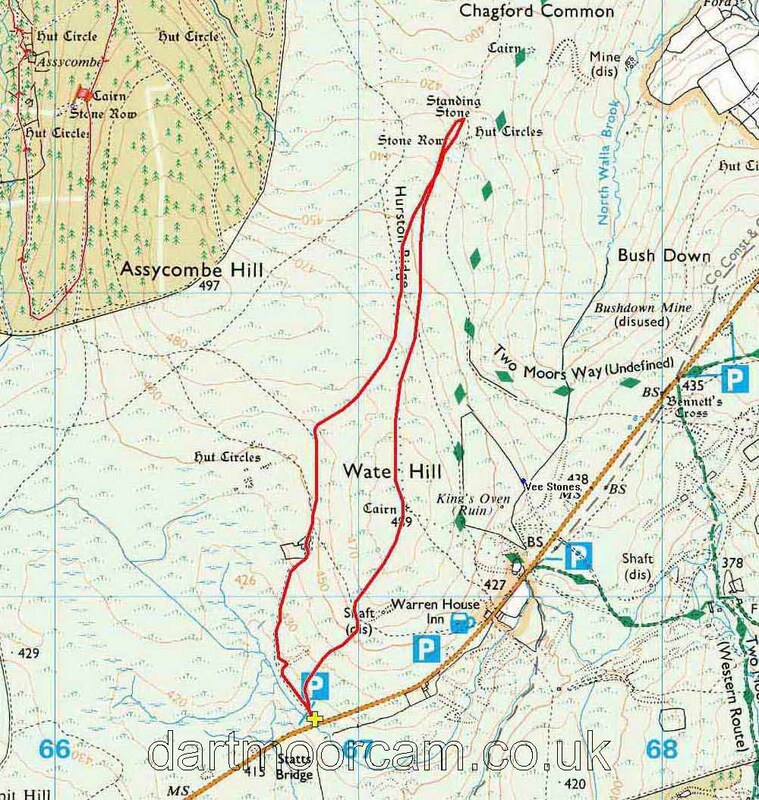 2, Page 31, Section 10: Hurston Ridge Cairn, the urn was found in a cairn on the west side of Assycombe Hill which is no longer marked on the latest 1:25000 map. Somewhere in this area is a cairn described by J. Butler (1991), Dartmoor Atlas of Antiquities II, 25.10 Hurston Ridge cairn, pages 31-32. The cairn was discovered and excavated by the Dartmoor Exploration Committee in 1900 and then it was "lost" again, shortly afterwards. It is labelled as "Cairn A" in a map linked from Legendary Dartmoor's Hurston Stone Row web page. Another view, looking east ..... an unusual prehistoric grave for Dartmoor. It may have excited the medieval mind in their attempts to interpret it and given rise to the name King's Oven (= Furnum Regis). It served as a bound mark during the 1240 Perambulation of the Forest of Dartmoor. It was known by this name for hundreds of years until the name became transferred to a nearby enclosure, said to be associated with tin smelting (where blowing house = "oven"). It has been crudely rebuilt as a shelter and as a lookout in WWII, and has been known as Natty's or Nancy's Castle. Showing four enclosures (marked by red flags) used by warreners: apparently the southern-most one was used for growing vegetables and the others were used for growing feed for the rabbits bred by the warreners for meat for the tinners. There were several mines in the vicinity and the Warren House Inn is another indication of mining and warrening activity. The story of these fields is told by John Hayward (1991, reprinted 2009), Dartmoor 365, Curlew Publications, page 152, although the sketch map includes the little double enclosure between the 2nd and 3rd fields coming down the page (just below the number "378") and excludes the field above the "68" grid label. Another view of the cairn, where the topmost stone was added during this walk. Walking back to Statts' Bridge, over the infant Statt's Brook, where turnpike road builders utilised the ancient pack horse track where the valley and mire narrow. 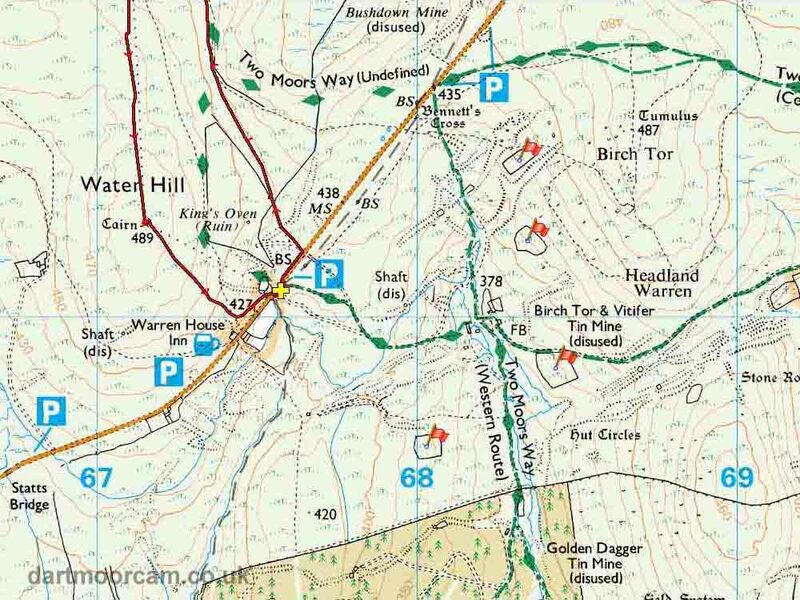 East of the bridge was the junction of two pack horse tracks - one from Chagford via Hurston Ridge and Caroline Bottom, the other from Moretonhampstead (on which the modern road is built). A closer look at the site of a large waterwheel from the era of Wheal Caroline. This walk was reached by driving east out of Postbridge towards Moretonhampstead to Statts Bridge, going over it and parking on the left. Distance - 4.47 km / 2.78 miles.